As most of you know I've spent a good part of the last couple of weeks doing work for Bike Walk Connecticut to promote Bike to Work Day - a thoroughly enjoyable assignment that has come to an end. A component of it had to do with a bike sign I made the afternoon before the Five Boro Bike Tour. Made from foam board and letters leftover from various DIYBIKING.COM signs, I assembled it in my living room in less than two episodes of 'Justified' season 1 on DVD. I sometimes measure time with television. During the weekdays I contacted as many people and companies as I could think of, wrote press releases, letters to the editor, sent notes to reporters, did what I could to help Connecticut Bike to Work Day Event hosts promote their events, and tried to get people to take the BikeWalkCT Bike to Work Day pledge. That part especially wasn't easy. Early in the week, some graphics person in the WTNH News 8 staff put a much darker cloud on Friday than on any of the other days, which were already iffy to begin with. Bike to Work Day rapidly began to transform into Oh-No-Please-Don't-Let-It-Rain Day. (However, while I'm on the subject: I do need to thank News 12's Kathryn Hauser as well as WTNH's Gil Simmons and Teresa Dufour for mentioning Bike to Work Day in their early morning reports - and on Twitter. I wanted as many motorists out there to be more alert than ever should they have to peer out into the world through a rain-streaked windshield. Telling everyone to be extra cautious made the whole day better and everyone safer). 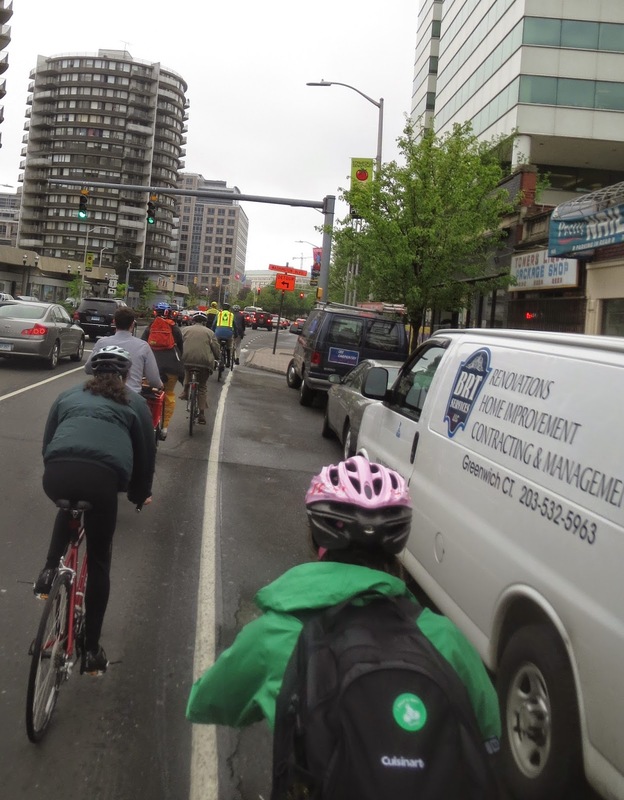 As I already reported, it was difficult to get anyone to talk about Bike to Work Day before the event, but just over the past several days, a few interesting things began to happen - and none of them had to do with Alec Baldwin. It started for fun, but I began taking pictures of my silly bike trailer/folding bike setup in front of bike shops and small businesses that I liked and later emailed them the photos. Several of them - Pacific Swim Bike Run, Lorca, and Danny's Cycles shared the picture. Even USACycling.org and Bike New York surprised me by posting it on Facebook, and my gym/yoga destination: Exhale Spa - which is having free core fusion classes during their Fusion Fest event next week - did too. But the real work in Stamford was being done by the Stamford Downtown Special Services District and South Western Regional Planning Agency. The poster they made was showing up in different independent businesses around town, and there was a lot of buzz around the fact that the DSSD was going to present Stamford mayor David Martin with a bike. 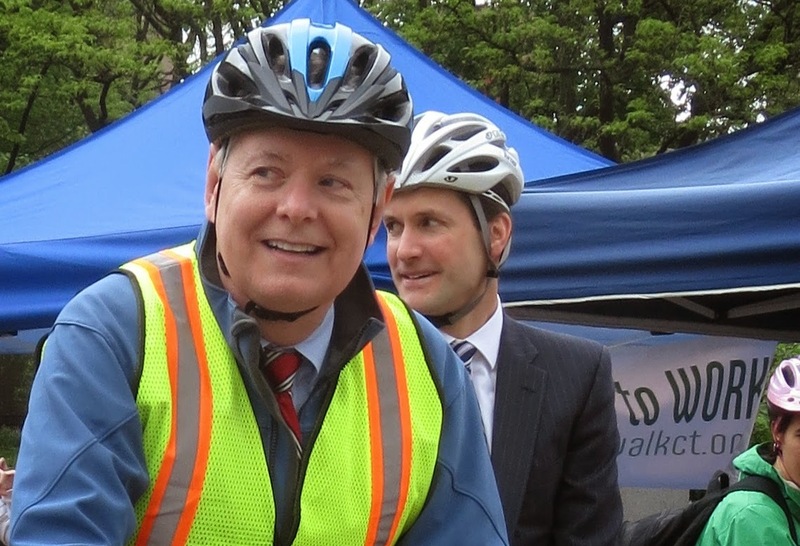 Even Congressman Jim Himes was slated to attend Stamford's Bike to Work Day Event. So this morning, even though it wasn't raining, I stretched a hotel shower cap over my helmet, put on a rain jacket, and rode my bike and trailer to Veterans Park - arriving a few minutes before the 7:30 start time. My worries that the forecast was going to keep everyone away faded quickly as it was actually turning into a fairly pleasant morning. So much so, I ditched my jacket the moment I got there. Before long, cyclists began arriving and enjoyed some service on their machines by Danny's Cycles. I also chatted with someone from Fleet Feet Sports, one of Lorca's Bedford Street neighbors that frequently organizes group runs. I don't run, but if I did, I'd run with Fleet Feet. Maybe that's a good pull-quote for their testimonials page. Never mind. After getting a great breakfast at the Vanchetta Food Truck I wandered back through the tents and the still-building crowd in time to spot Congressman Jim Himes arriving in style. Connecticut's fourth district - or as Stephen Colbert might say, the 'fightin' fourth!' - was officially represented. The congressman impressed me by remembering the brief meeting we had in Stamford several weeks earlier (mentioned in a piece I wrote for Bike Walk Connecticut), and impressed me further by saying he had read my post/white paper on the future of bike share. Congressman Himes, by the way, holds a membership key for Capital Bike Share. As the crowd built up, Mayor David Martin materialized as did others from DSSD. Before the speeches I was able to take what would become my favorite shot of the day: a picture of my congressman taking a picture of my bike trailer. Shortly after, Sandy Goldstein, the president of Stamford DSSD, took to the stage and gave a short but energetic speech. Much to my amazement, a brief part of her address was quoting a letter to the editor that I wrote the Stamford Advocate days earlier that was published in today's print edition (under the headline 'Peddling Bike to Work Day'). It was the part about how I asked Stamford drivers to realize how much time they spend in traffic watching traffic lights go from red to green and back again without moving. I immediately thought of the scene from When Harry Met Sally when Bruno Kirby's character gleefully exclaims to Carrie Fisher's character: "Nobody's quoted me back to me before!" Congressman Himes (pictured) leaned his kickstand-less, not-quite-as-old-as-dirt Specialized bike on the ground and gave a great speech on the value of cycling. His words were carried over the crowd quite well with the aid of SpeakerBike, which, seen on the left side of the picture below, has become an integral part of Stamford's cycling lore. Mayor David Martin took to the stage to thank Sandy for the introduction before giving a speech of his own and accepting the bike, which was being presented by DSSD and Allied Barton Security Services. The bike, which came from Danny's Cycles, looked good as the blue cloth that covered it was unfurled. I glanced to my left and saw Christina Chiarelli of Itsrelevant.com, thinking back to when I spoke with her and then mayoral candidate David Martin when I did my Cycling with Candidates project last summer. Martin indicated to me and to Itsrelevant.com that he wanted to have his own bike when elected mayor so he could use it to get around the city. I took him at his word but still thought to myself: I'll believe it when I see it. Minutes after the speeches, several people mounted up to take a ride with the mayor and the congressman to the government center, which was once again a Groundhog Day-like moment as I recalled the last time I rode there. 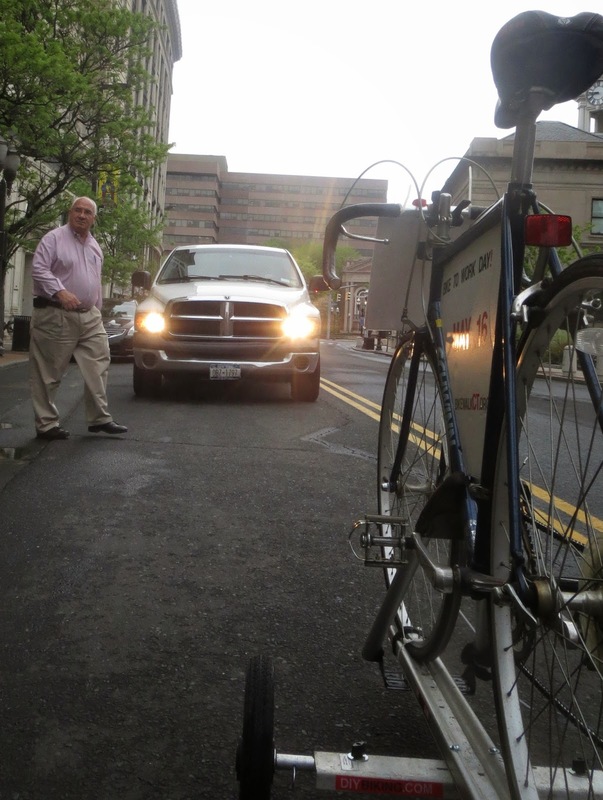 I mounted up my folding bike and, trailer in tow, followed the group to the government center. Much to my good fortune, the trailer neither failed nor caused any problems for any of the cyclists. I would have felt horrible if Congressman Himes crashed into me and fell - especially if it was captured on video someone would probably try to use the footage for an attack ad. But the ride went well with no rain and (thankfully) a lot of patience from Stamford's motorists. It was possible that they were just as happy to not have to drive in a deluge as we were with not having to pedal in one. At the government center, we all laughed and talked for a little while (though I truly regret not trying to take a group picture) before we headed off our separate ways. I thanked the Mayor and Congressman Himes before pedaling back to the event to again thank the DSSD for making it all work. After the tents came down, I headed up Bedford Street and stopped in front of Lorca (which is having their to celebrate with a cappuccino. I looked out onto Bedford Street, watching people pass by my stopped bike, and began to feel a sense of relief that it wasn't just me who felt Stamford is a great city that just needs attention. I began to wonder again what Bedford Street would look like with sensibly designed bike racks. I began to wonder how many more cyclists would attend tomorrow's People Friendly Stamford ride (Saturday, May 17th) that starts at Latham Park now that Saturday's forecast looks great. I began to wonder whether more people were taking the Bike Walk Connecticut pledge now that the weather wasn't as apocalyptic as once feared. Do you think your city could work better for cyclists? Begin to wonder, then begin to take action. Thanks for reading and thanks for riding. (You can view Christina Chiarelli's report on Stamford's 2014 Bike to Work Day Event by clicking here).